Experience a Dressage holiday at one of the finest Equestrian centres in Portugal. The riding program offers private lessons on highly trained dressage horses where beginners and advanced riders can enjoy the pleasure of riding superbly schooled horses. Your instructors and trainers have vast experience and the highest qualifications. Sample local Portuguese home cooking and take the opportunity to taste the fine wines the farm produces. Don’t forget to visit the famous Portuguese riding school if you get the opportunity in Lisbon. We offer Dressage and Working Equitation horse riding holidays to beginner and advanced riders, depending on your interests. The usual program includes two private dressage lessons with one in the morning and the other in the afternoon, but if you prefer a trail ride or a working Equitation lesson this can be requested in advance. 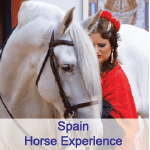 All riding programs are designed for riders who want to concentrate on improving their riding skills, while learning from top class instructors on highly trained Lusitano horses. This is a supreme dressage intensive holiday for riders with a passion for the sport. Ride some of the most advanced movements, including Passage, Piaffe and Spanish Walk. Experience great instruction on top-quality pure-bred Lusitano horses at this riding centre near Lisbon. The resident instructor Pedro Teixeira Farto is an experienced rider and trainer. With his creative, passionate and straightforward approach your riding is sure to improve. The equestrian centre is a sight to behold. Each small detail has been planned to perfection, from the light and airy stables to the beautifully-appointed tack room. Facilities include a 20×40 indoor arena with mirrors, 20×60 outdoor covered arena, working equitation paddock, lunge pen, wash-boxes and tack-room. Lessons are always on a private basis, enabling you to concentrate wholly on what you wish to achieve, whether it be to strengthen your position, improve your lateral work or get the hang of one-time changes. The chief instructor is Pedro Teixeira Farto, an experienced rider and trainer with a creative, passionate and straightforward approach to his teaching. You can choose an intensive programme with two lessons per day, or a more relaxed schedule with one lesson a day. When you are not riding, there is a great deal to be gained from watching the staff training the horses, or perhaps watching other guests have lessons. Between mid-September and mid-June, it is sometimes possible for experienced riders to be taken to ride the dressage horses on Areia Beach. This activity cannot be guaranteed because it is subject to experience levels, availability, tide and weather conditions and so can only be arranged locally (c. €140 per person – payable locally). The accommodation is four spacious guest cottages. Each cottage is equipped with a fireplace, television and music player. There is a kitchen where guests can help themselves to tea, coffee and cold drinks. Each cottage has a garden or terrace area. There is also a suite adjoining the main family home, with a private entrance from the garden. There is a swimming pool, with BBQ and gym area, as well as tabel tennis, tennis and basketball courts for guests to enjoy. The riding centre is a few minutes’ walk from the main farm down a private drive and across a country road. Please contact us for further information and details at info@snaffletravel.com.au. You will be staying in the charming apartments which are tastefully decorated with a sitting area, dining room and kitchen area to make tea and coffee. The property is well maintained and beautifully manicured yard. The farm is close to the beach and has a swimming pool with a retractable roof for all seasons, tennis court, table tennis and you can borrow bikes. All meals are taken in the communal dining area and the wine tasting is available. The property is 45 minutes from Lisbon airport and transfers can be arranged as well as private tours to other nearby areas. The food is typical home cooked Portuguese food taken in the main dining room with all the guests and breakfast, lunch and dinner are included at set times. Wine is available but not included. Please enquire for shorter program rates, single supplements and non-riders rates.Rates are based on the Euro and subject to currency fluctuation, so please contact us for the most up to date pricing for your riding holiday. Accommodation; all meals from dinner on day of arrival through to lunch on day of departure; coffee/tea with meals and in guest cottages; riding as per chosen programme. The farm is located approximately 45 minutes North by car from Lisbon Airport. Warm and dry for most of the year. During July & August temperatures can reach the late 20’s°C or early 30’s°C. But being close to the coast means that it does not become too uncomfortable for riding. The wettest months are October to March when it can also feel a little chilly, particularly in the evening.